Proxama, the leading developer of near field communications (NFC) technology, has announced that it will be collaborating with Nokia on developing NFC applications for the new generation of smart phones, starting with the Nokia C7. Proxama has designed a complete NFC-driven service package, featuring its unique TagCenter application that will enable Nokia NFC phone users to get instant, media-rich brand experiences from NFC data tags that will be on posters, product packaging and point-of–sale displays. 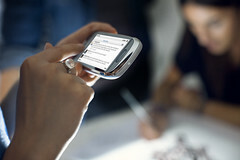 The Nokia C7 is the first Nokia handset to make use of Proxama’s TagCenter. The global roll out of Nokia NFC-enabled phones presents brands, advertisers, media owners and retailers with exciting new opportunities to reach customers through NFC marketing campaigns. TagCenter – a unique application which instantly reads and loads media-rich content from tapping the handset on data-encoded advertising tags (see below) and also provides links to other apps and web content. NFC advertising tags – data tags containing programmable microchips that hold media-rich content which is sent to an NFC-enabled mobile when tapped, to provide an instant brand experience such as a voucher, coupon or video. The tags can be laminated onto posters, embedded into product packaging or stuck onto trading cards, key fobs and a host of other marketing collateral. PosterTouch campaign manager – a campaign management server which enables advertisers to create new NFC advertising tags and importantly monitors and collates detailed customer analytical data, allowing advertisers to have valuable real-time campaign analysis at their fingertips. Commenting on the deal, Neil Garner, Founder and CEO of Proxama said: “The NFC mobile phone is now a reality. This collaboration with Nokia means that, very quickly, consumers around the world will be able to enjoy much more rewarding interaction with their favoured brands. Proxama’s TagCenter will breathe new life into traditional media channels that have been in decline, by enabling them to deliver to consumers a much more engaging experience. It also offers advertisers something of a Holy Grail; because these channels will be instantly more measurable, advertisers will have the ability to monitor and measure actual consumer behaviour that is prompted by the NFC interaction.